Lion’s Arch honors the defiant spirit of its citizenry with the rousing Dragon Bash festival, when revelers laugh in the face of fear! Sponsored by the Captain’s Council of Lion’s Arch, Dragon Bash is a month-long celebration packed with all-new activities, fireworks, exclusive rewards, and surprises galore! The festival begins on June 11 and ends on July 9. Lion’s Arch is the bustling epicenter of the Dragon Bash festivities. The Captain’s Council has spared no expense in decorating this proud, battered city, as evidenced by the giant holographic dragon harmlessly soaring overhead. Look for holographic projectors scattered all across Tyria during the celebration. These mini-projector devices contain hologram minions which can drop a Dragon Bash surprise… a Dragon Coffer! Starting June 18, you’ll also find dragon effigies all across Tyria during Dragon Bash. Perform a ritual dance and light the effigy to receive a temporary boost! Take an inside look at Dragon Bash with ArenaNet devs during the livestream on our Twitch channel on Tuesday, June 11 at 12PM PDT. The ancient Tyrian pastime of Dragon Ball returns! Teams of players test their Dragon Ball skills against one another in this fast-paced game of skill and reflexes. Get ready to dodge! Pick the fastest moa! Farshore Ward in Lion’s Arch is the site of fast and furious Moa Racing, where you can bet on your favorite moa racers! In major cities around Tyria, you’ll find dragon piñatas strung up in honor of the festival. Break these open to receive tasty Dragon Bash candy! 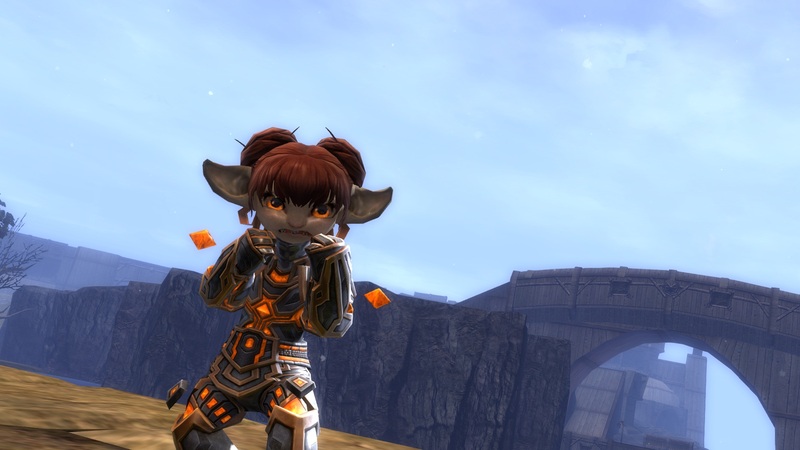 Watch the skies above Lion’s Arch come alive with an explosive fireworks show every night in-game. The fireworks begin at 9AM PDT on Friday, June 14 and will go off every two hours until 12PM PDT Monday, June 17. Stay through the spectacular finale and receive a unique festival helm – The Horns of the Dragon! Join the Captain’s Council and other dignitaries as they light dragon effigies in the Grand Piazza of Lion’s Arch starting June 18. Hosted by the jovial Magnus the Bloody Handed, this ceremony will be full of merriment and surprises. This unique helm is only available to players who attend an entire fireworks show in Lion’s Arch, which occurs every two hours during the in-game evening from June 14 to June 17. This dragon wing back item is only available as a very rare drop in the Dragon Ball Arena and throughout Tyria during the celebration. Ambitious adventurers who collect a large amount of Dragon Bash candy can obtain these exclusive holographic festival wings. Dedicated festival goers who earn the Dragon Bash Meta Achievement will receive this imposing back item – a set of holographic Shattered dragon wings! This special reward chest, which drops only during Dragon Bash, is packed with treats and a chance for fireworks, a hologram minion mini, and Dragon’s Jade weapon skins! Show your Dragon Bash spirit with these cool new weapon skins with a distinctly draconic look. You can find weapon tickets inside Rich Dragon Coffers and (rarely) in Dragon Coffers, and exchange them for weapon skins from Black Lion Weapon Specialists in every major city! You’ll only find this adorable helmed version of the moa mini during Dragon Bash! Purchase this mini with vouchers earned from the Moa Racing activity. We’ve improved the way that the PvP leaderboards reflect excellence! Inactive players will automatically start to slip down the leaderboards over time, allowing new and active players an opportunity to fight their way up to a higher rank. This means that the leaderboards will more accurately represent the best PvP players. In the new Authorized Shoutcaster Program, when highly rated PvP teams are matched-up in rated play, authorized shoutcasters will receive a notification and be allowed to enter that match as a spectator to bring you the action on a slight time delay. Next story Whimsical New Items in the Gem Store!